How great is this? 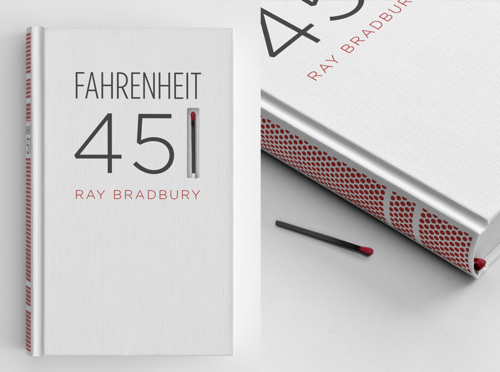 Designer Elizabeth Perez designed this book cover of Ray Bradbury's classic novel Fahrenheit 451, that comes with a match and striking paper on the spine. Perez says: "Fahrenheit 451 is a novel about a dystopian future where books are outlawed and firemen burn any house that contains them. The story is about suppressing ideas, and about how television destroys interest in reading literature. I wanted to spread the book-burning message to the book itself. The book's spine is screen-printed with a matchbook striking paper surface, so the book itself can be burned." Posted on April 5, 2013 by Jess Janz and filed under lovely things- and tagged book covers creative Elizabeth Perez Fahrenheit 451 publishing Ray Bradbury.